Sounding like something straight out of science fiction, a new camera technology developed by researchers at the Massachusetts Institute of Technology (MIT) can actually visualize photons of light passing onto and by objects. 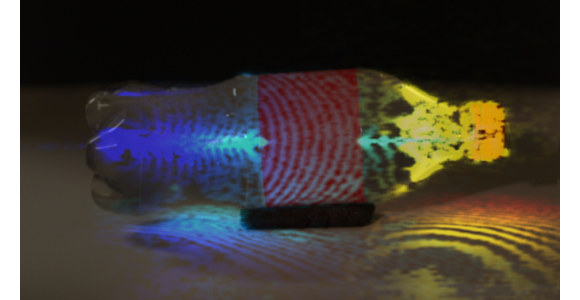 The group has posted a series of videos which show the amazing properties of light as never seen before. In the future this technology may also be used to see around corners and aid doctors by delivering imagery of the interior of the human body with out the use of X-rays. The new camera heralds the dawn of what the researchers are calling ‘Femto Photography’. Presumably the name comes from the extreme speed with which each frame is captured (femto is a unit meaning 0.000000000000001). The revolutionary technique is pioneered by the MIT Media Lab’s Camera Culture group which also collaborated with the Bawendi Lab in the Department of Chemistry at MIT. In order to create the ultrafast imagery, the researchers use ”femtosecond laser illumination, picosecond-accurate detectors and mathematical reconstruction techniques”. Rather than using conventional lighting techniques, the special equipment requires a titanium sapphire laser which acts as a bright and very accurate strobe light. Over the course of multiple exposures the video scenes are created by stringing together the femtosecond exposures of 480 frames. The represented exposure time on the videos is a mere 1.71 picoseconds. Ramesh Raskar is a key developer of the system, and is currently an Associate Professor with the MIT Media Lab. According to his MIT biography, Professor Raskar joined MIT after leaving Mitsubishi Electric Research Laboratories in 2008. His other current projects include inexpensive eye care devices, human-computer interaction systems, and a second generation CAT-scan machine. Amazingly, Professor Raskar is the only member of his immediate family to have even a high school education. Having been born in India to a family of farmers, he rose out of his circumstances through his father’s insistence on education rather than working the land. You can view a video of Professor Raskar presenting his findings during his TEDGlobal talk as well. During his explanation, he speculates that this device will enable us to “look around corners” and “see inside our body without an X-ray”. It’s a very stimulating and insightful presentation. Although the technology being researched will not be in commercial development anytime soon (Professor Raskar expects it to be years from now for practical commercial applications), its implications and inspiration are widespread. For a bit of perspective one can compare this actual futuristic development with the expected future of photography as prognosticated by photographers in 1944. Devon Littleton is a tech writer and adventurer writing on behalf of 34sp.com. He recently trekked across lava in Hawaii. Devon is a devoted Internet enthusiast.